Reality Check: What would wiping student debt cost? The Green Party has pledged not only to scrap tuition fees for university students, but to wipe all existing debt held by graduates. In March 2016, the total amount of debt owed by English students and EU students studying in England was £76.3bn. To write off this debt, the Greens would have to pay out that amount from the public purse or find some other way of funding it. This would represent a large outlay of cash from the government, although presumably it would only be a one-off payment, unlike their pledge to scrap tuition fees. Bundles of student loans have been sold on to private investors in the past, which is one way to bring back some money into the Treasury's coffers. But we have to bear in mind that not all student loans get paid back. Graduates under the current system do not have to start repaying their loans until they have an annual income of more than £21,000. And outstanding fees get written off after a number of years - 30 years for English and Welsh students who started courses after 2012 and 25 years for students who started courses between 2006 and 2012. So the government would have ended up paying some of that £76bn anyway. Scottish students studying in Scotland have not had to pay anything towards their tuition since 2008. When tuition fees were £3,000 a year, the majority of students (about 70%) were expected to pay off all their debts. Under the new £9,000 a year system, only 30% of students are expected to pay back every penny. 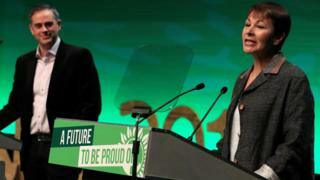 On top of the plan to wipe out existing debt, the Green's plans to scrap tuition fees would add several billion pounds to the country's annual spending. Labour has also promised to scrap tuition fees for students in England. In the short-term, estimates suggest the government would have to put aside about £11bn a year to pay for tuition fees. Once you factor in the people who will not end up paying back their loans, in the long-term the policy is expected cost the government £8bn a year.